Here’s what’s up in the world of TV for Friday, October 28, and Saturday, October 29, 2011. All times are Eastern. 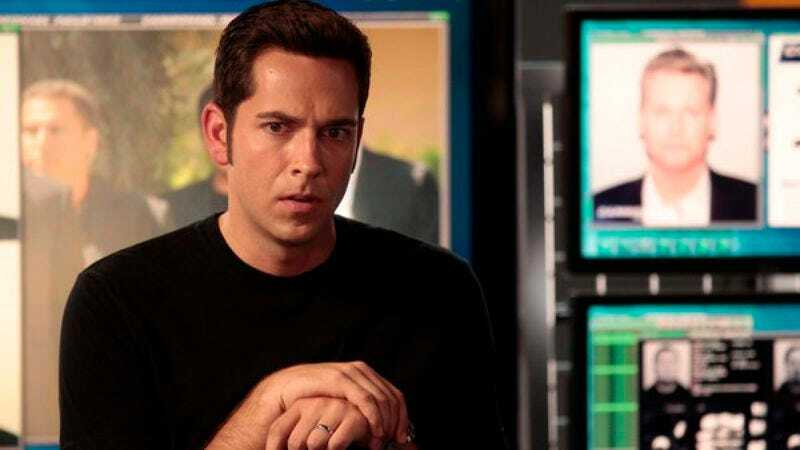 Chuck (NBC, 8 p.m., Friday): Back when Chuck debuted, it was the lead-in to the then-prominent Heroes, a show coming off an Emmy nomination for Best Drama Series that was expected to raise all tides at the beleaguered NBC. Instead, Heroes perished after four seasons, and now, Chuck will, somewhat inexplicably, have more episodes than that show, despite never catching on at the level its most beloved fans (who are seriously the most insane fans who have ever lived in terms of level of devotion relative to show’s prominence within the national zeitgeist). This is being billed as the final season—and it probably should be, what with Morgan being the Intersect and all—but with the state NBC’s in, we wouldn’t be surprised by a back-nine order, a renewal for seven more zombie seasons, and a statue of Zachary Levi being erected in downtown Burbank. Ryan McGee will speak at the dedication. A Gifted Man (CBS, 8 p.m., Friday): Michael is surprised to find that a football player he once treated at his gleaming, space-age clinic is now seeking treatment at the free clinic he spends more and more time at because he’s homeless. It’s not that Michael’s surprised to see a once-rich man struggling with poverty; he just had no idea homelessness was a thing. Expect lots of dramatic squinting, meant to convey his serious thought processes, and laughter from Todd VanDerWerff. Grimm (NBC, 9 p.m., Friday): The World Series’ decisive game getting pushed to tonight has had the worst possible effect on one of the other networks, and of course it’s NBC, which was planning to launch an all-new bloc tonight. So that means fairy-tale procedural Grimm will get trounced in the ratings, and NBC will fail to launch a new hit drama yet again. The silver lining? Maybe all of the Fringe fans pissed at the Rangers for failing to close it out against the Cardinals will watch this instead. Kevin McFarland and Ryan McGee have their dueling takes on the series this afternoon. Supernatural (The CW, 9 p.m., Friday): “Clones” of Sam and Dean go on a killing spree, putting the real articles on the FBI’s most wanted list. Sure, sure, guys. We’ve heard it all before. Somebody just “happened” to steal your identity and start killing people? That’s what they all say, you realize. They all say “Clones stole my identity, and they’re the ones responsible for the serial murders.” Zack Handlen’s heard that one a million times. Boss (Starz, 10 p.m., Friday): Or: Hey! This show is still on! Meredith Blake didn’t think much of last week’s debut of this new series, but maybe she’ll be more impressed with this week’s episode, which involves a lengthy battle over a stalled city council resolution and involves lots of ward politics. Because there’s nothing more exciting and television-ready than ward politics, wouldn’t you agree? Buffy The Vampire Slayer and Angel (1 p.m., Friday): Noel Murray is closing in on the end of Buffy The Vampire Slayer, and today, he embarks upon one of the final story arcs of the series, that whole wacky thing where the Scooby gang abruptly decided they didn’t like Buffy anymore and kicked her out of the house because the writers had a bunch of episodes to fill before they could get to the big showdown. The Twilight Zone (1 p.m., Saturday): What’s a better way to spend Halloween weekend than reading a review of a Twilight Zone episode about a creepy hitch-hiker? We can think of few better ways, and the only ones we can think of would involve you leaving the house, and nobody wants to do that. Zack Handlen is a beautiful girl who died in a car accident on the night of her prom and now waits for people to pick her up and take her home along Old Highway 57. Prayer For A Perfect Season (HBO, 8 p.m., Friday): This new HBO sports documentary follows a high school basketball team in its quest for… something. We really wish we knew what, and it doesn’t appear we’re getting any help anywhere. So we’re going to assume their quest is for a nice set of dapper suits to wear to the gubernatorial ball. Yes. That sounds right. Gold Rush: Alaska (Discovery, 9 p.m., Friday): We’d pretend that we’re excited about this show because we love gold mining and all depictions of it, but we’re mostly just thrilled that the whole thing where The Soup constantly plays footage of this show mostly just edited down to usage of the phrase “glory hole” will be returning to us very soon. Miami City Ballet Dances Balanchine And Tharp (PBS, 9 p.m., Friday): What? You guys are against a little culture? You think you’re going to have a better time going out drinking and seeing what slutty costumes people are wearing than you are watching the finest dancers in Miami interpret the choreography of Balanchine and Tharp? Well, we just don’t know what to say to you. Philistines. My Extreme Animal Phobia (Animal Planet, 10 p.m., Friday): Did you see the A.V. Club Chicago excerpt from this show, that featured the big, beefy biker dude whimpering in terror at a pit bull puppy? If you didn’t, check it out right away and share our hope that the second episode will be about a professional wrestler who’s reduced to tears by the sight of ducklings. Transsiberian (Showtime, 7:30 p.m., Friday): This moody modern noir—set onboard a train hurtling through Russia—isn’t perfect, but it makes great use of eerie Russian locations and winter in the world’s largest country to draw viewers into the film before losing it all on a climax that doesn’t quite work. Still, the buildup is impressive, and the movie moves quickly enough to keep you invested. Drag Me To Hell (USA, 9 p.m., Friday): If you’re looking for the roots of the current economic crisis and the banking issues that doomed the world economy back in 2008, you can’t do much better than this film, which reminds us that the whole thing was caused by an evil old woman’s curse. Remember that the next time you start demonizing politicians and/or bankers. It was the curse. World Series, Game 7: Rangers at Cardinals (Fox, 7:30 p.m., Friday): There hasn’t been a seventh game in the Series since 2002, when the Angels defeated the Giants, and while we wouldn’t place this Series as a whole with the all-time greats, game six definitely deserves to be in the conversation of greatest World Series games ever played. See which team walks away with it all. From The Sky Down (Showtime, 8 p.m., Saturday): Steven Hyden makes a rare visit over to TV Club to check out this new documentary (which technically debuted at the Toronto International Film Festival) about the recording of U2’s Achtung Baby. We used to listen to “One” while we sanded in wood shop, so we know a little something about musicianship and/or pain. Possessing Piper Rose (Lifetime, 8 p.m., Saturday): It’s the Saturday before Halloween, which means it’s time for a delightfully batshit Lifetime movie about something stupid, right on schedule. Tonight, Rebecca Romijn plays a woman who adopts a child—then finds the child can see her dead birth mother. If it really wanted to be creepy, Piper would see all of the fees Romijn accrued trying to adopt her. The Pig Farm (Investigation Discovery, 9 p.m., Saturday): This two-hour-long Investigation Discovery documentary takes us into an investigation that leads to the brutal serial killer Robert “Willie” Pickton. Here’s a spoiler: A pig farm is involved in some form. Plus, don’t you think everybody should have realized what was up when a guy named Robert took the nickname “Willie”? Zombie Apocalypse (SyFy, 9 p.m., Saturday): It’s been a while since we dropped in on a SyFy original movie, so we thought we’d sacrifice Scott Von Doviak on the altar of having to watch this one—which is about zombies or something—while the rest of the world is out having fun. Godspeed, Von Doviak. Godspeed. Cat People (TCM, 8 p.m., Saturday): It’s hard to call producer Val Lewton’s masterpiece from the 1940s “scary” in modern terms, but it certainly retains a certain eerie, spooky chill. Simone Simon plays a woman who, in fits of jealousy, may or may not turn into someone of the, er, feline persuasion. Which is cool and all, but if she really wanted to impress us, she’d drop the “E” and just become Simon Simon. The Shining (IFC, 8 p.m., Saturday): C’mon. You know how this one goes. Family. Remote hotel. Scatman Crothers. Twin girls. Blood out of the elevator. Rotting woman in a bathtub. All work and no play. Ghosts. Axe to a door. “Here’s Johnny!” Man hooking up with a dude in a dog suit. Snow-cat. Hedge maze. Frozen. Creepy photo. If you haven’t seen this, we just spoiled it for you, sort of. You’re welcome. Bull Riding: PBR World Finals (Versus, 9 p.m., Saturday): The “PBR” stands for Professional Bull Riders, but we’re dumb hipsters who hate to use Google, so we’re going to assume it stands for Pabst Blue Ribbon and show up en masse in our dumb glasses and our dumb stupid clothes and then be disappointed when it’s just a bunch of dumb guys on dumb bulls. The Secret Circle (Thursday): If you’re not watching this—and judging from our “I watched this” feature, you’re not—then you’re missing a supernatural teen soap that’s just coming into its own. You should really be following along, so you can say you were there when it took the leap and got really good, you and Katherine Miller. Or maybe it won’t get good, and you can waste your life watching something that gets to that B+ but never gets over the hump. Your choice, really.